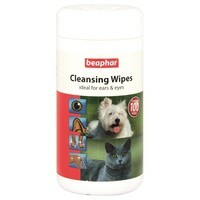 Beaphar Cleansing Wipes 100 Pack are the perfect multipurpose wipes that are suitable for a variety of different needs. These moistened wipes contain hygienic cleansing agents that help to clean while Aloe Vera extracts help to soothe. Ideal for cleaning around the eyes to remove tear stains or the ears, these wipes help get rid of daily dirt and odour helping your pet to stay fresh and clean at all times. Also invaluable to use after walks when the pads need a bit of a wipe before walking on those precious carpets! Rubbish really, ok if you had a mouse, wouldn't recommend, definitely not getting these again. Not impressed with these at all. Very small and thin. It's a good job there are 100 wipes for this price as you need a few to be able to clean anything more than an eye.